Embark on a profitable venture with 32Red Casino when you play the phenomenal horse-racing themed video slot from Microgaming, complete with respins, free spins, wilds, scatters, and more. Spending a day at the racecourse is an enjoyable and memorable experience, giving punters the opportunity to make a significant profit if they do their research on the horses and jockeys that will be racing during the day. However, most of us don't have the time to do the necessary research that will lead to an informed decision to make a profit. It's for this very reason that Microgaming decided to develop a horse-racing themed slot that players can enjoy at home without having to worry about research or a winning horse. 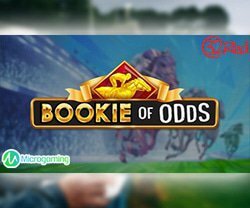 The latest slot creation from Triple Edge Studios and Microgaming is called Bookie of Odds and it comes equipped with five adrenaline-infused reels with three rows and only 10 fixed paylines. You will also find plenty of winning opportunities embedded in the game thanks to a wide selection of bonus features, such as scatter symbols, free spins round, wild symbols, and a re-spin feature along with a top jackpot prize worth 500 coins. Players will also appreciate the fact that the slot can be enjoyed on a desktop as well as the 32Red mobile casino platform that can be downloaded on both Android and iOS devices. The golden horseracing journal will act as both the scatter symbol and wild symbol on the reel set. The golden journal will substitute for all regular symbols to potentially form a winning combination and will have the power to unlock the free spins round embedded in the video slot. Players are required to display a minimum of 3 golden journal scatters anywhere on the reel set to trigger the free spins round. Displaying 3, 4, or 5 golden journal scatter symbols will reward players with 10, 12, or 15 free games, respectively. After the free spins round is triggered, the game will randomly select one of the standard symbols to expand during the free spins round. If the randomly selected symbol forms part of a win, it will automatically expand to hopefully offer a bigger cash reward. Players will also be pleased to know that the free spins round can be re-activated when three or more golden journal scatter symbols are displayed during the free spin feature. Apart from the free spin feature, players will also be treated to a marvellous re-spin feature. Situated below each of the 5 reels is a re-spin button. This will allow players to respin any of the 5 reels at an additional cost. Players can respin each of the 5 reels as many times as they wish to hopefully activate a huge win or even the free spins round when there's only two golden journal scatter symbols on the reel set. The new Bookie of Odds slot from Microgaming might be rather limited due to the fact that it has 10 fixed paylines. However, this is quickly rectified when you look at the assortment of betting options infused within the control panel below the reel set. Players can choose from a wide range of betting limits per spin, starting at a minimum of $0.10 and peaking at $25.00, which is the maximum you can bet on a single spin. The slot also impresses with an incredible variety of theme-related symbols to further enrich the atmosphere and gameplay experience. The high-valued symbols include a bookie, the highest paying symbol on the game worth 500 coins, along with 3 different horses in an assortment of colours, including red, purple, and blue. The low-valued symbols consist of card values, starting at Ace and ending with 10. Triple Edge Studios and Microgaming's new Bookie of Odds slot offers a terrific 96.50% return to player ratio. Before you make your way to the racecourse, we recommend that you claim a bonus at 32Red Casino to increase your chances of walking away with a sizable profit.